Just to let you in on it, Swanlake Accessories offers trendy pieces at affordable prices. I mean it when I say affordable! You can get statement necklaces for as low as P100, and their yummy arm candies are around P125-P150. Dude, that's really fit for student budget, yes? So, if you wanna get your hands on them now, go to their Facebook and e-mail them to order! To join, just accomplish the mandatory steps on the Rafflecopter widget below and if you want additional entries, those will pop up after you've accomplished all mandatory entries. Got it? Go! 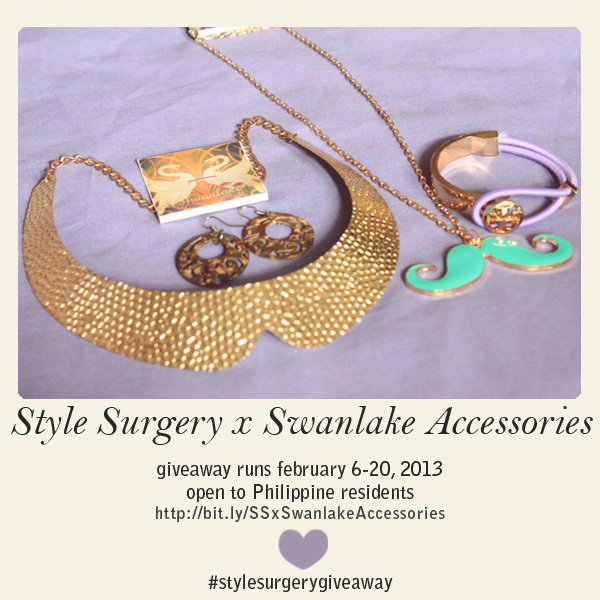 This giveaway runs from February 6-20, 2013. Winner will be announced on Facebook and Twitter, so stay tuned! Yay! Giveaways! Loving the purple bracelet.